Here are three unique surround experiences remixed from the original 1965 masters. You can select the “On Stage Concert Hall” surround mix and hear what it would be like to be onstage with Vince Guaraldi, with a larger-than-life orchestral sound. And you can also hear the trio in a small piano bar by selecting the “Jazz Club” mix, or experience them from the front row of Carnegie Hall with the “Front Row” surround mix. SuperDisc plays music in High Definition Surround™ (HDS™) and works with any DVD player. Every SuperDisc recording has been carefully remixed and remastered to bring out the best performance possible from today’s home theater and car stereo systems. You’ll hear more clarity, punch, dynamics and vocal presence than the regular CD. SuperDisc also includes high definition digital music files. Encoded directly from the master recordings at the highest resolution possible these digital music •les will sound better than if you “ripped” the music from the CD yourself. Monster Music Delivers A Surround Experience Even When You Don't Have A Surround Sound System. Also included on your SuperDisc are digital music files specially encoded in Dolby® Headphone surround. This new technology makes it possible to get a virtual surround sound experience from ANY pair of headphones on any portable music player, including Apple® iPod®. Audio quality, multiple surround mixes—even the digital music files have been THX certified for high-quality sound. What Else is on the Disc? • Home Theater Performance Tips: Get the best performance possible. • THX Optimizer: Easy calibration for your system. • Superdiscs are not DVD Audio discs, they are compatible with any DVD player. It just isn’t Christmas without Schroeder sitting on the floor, crouched over his miniature piano, playing the tune he named after his neighborhood pals. “Linus and Lucy” is one of the most recognizable jazz standards of all time. It has been covered by artists as diverse as Oscar Peterson and Steve Vai, and is indelibly connected to the life and work of Charles Schulz. Charles Schulz was in a San Francisco taxi when he first heard the Vince Guaraldi Trio. The playful jazz melodies and light, allegro tempo seemed the perfect accompaniment to a documentary he was calling A Boy Named Charlie Brown. The performance he heard was a live broadcast from a local nightclub. Schulz demanded to be driven directly to the club. He told Guaraldi about the pilot for a documentary and asked if he would be interested in collaborating. The San Francisco native known as Dr. Funk had already achieved great success with the Grammy-winning single, “Cast Your Fate To The Wind.” He liked the idea and composed what was originally called “Jazz Impressions of a Boy Named Charlie Brown.” In 1965 Schulz suggested that he do a Christmas album. The trio consisted of Fred Marshall on bass and Jerry Granelli on drums, they recorded in a San Francisco studio in 1965. 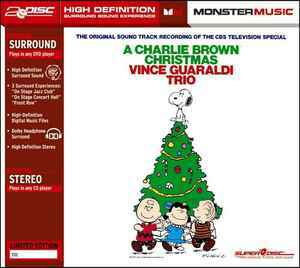 Those recordings became the soundtrack for the classic television special A Charlie Brown Christmas and one of the most popular holiday albums of all time.